In fact, every morning I drink out of a mug with that quote on it to remind myself of Vivian’s wisdom: IT’S NOT ABOUT GETTING TO THE OTHER SIDE. With chronic illness, the important exercise is to get out the rain boots and start stomping in the puddles — to not let the downpour stop you from living. Going into the second decade of living with a host of conditions — retractable depression, inflammatory bowel disease (IBD), hypothyroidism, pituitary tumor, aortic valve regurgitation, Raynaud’s disease, and connective tissue issues — one of the bigger mistakes I keep making is hanging on to the promise that if I do everything “right,” I will be freed from all symptoms for the rest of my life. If I follow the right diet that won’t aggravate my Crohn’s disease or cause brain inflammation that makes me depressed; if I exercise in such a way that doesn’t raise my cortisol and further deplete my adrenals (like running can) or wipe out my good gut bacteria (like swimming in chlorine can); if I practice mindfulness instead of cuss and reduce my stress…if I do all these things, I will be fixed! One day this past summer I was especially discouraged because, having returned home from a family vacation very depressed and anxious, I realized I couldn’t practice my health regimen perfectly every day for the rest of my life. There would be times I wouldn’t be able to make it to yoga, and my sleep would be compromised. Fresh kale wouldn’t always be in the fridge. I should expect lots of more evenings out when a waiter sets a basket of hot fries or tortilla chips right in front of me, or my daughter can’t finish her hot fudge sundae and my willpower wilts. 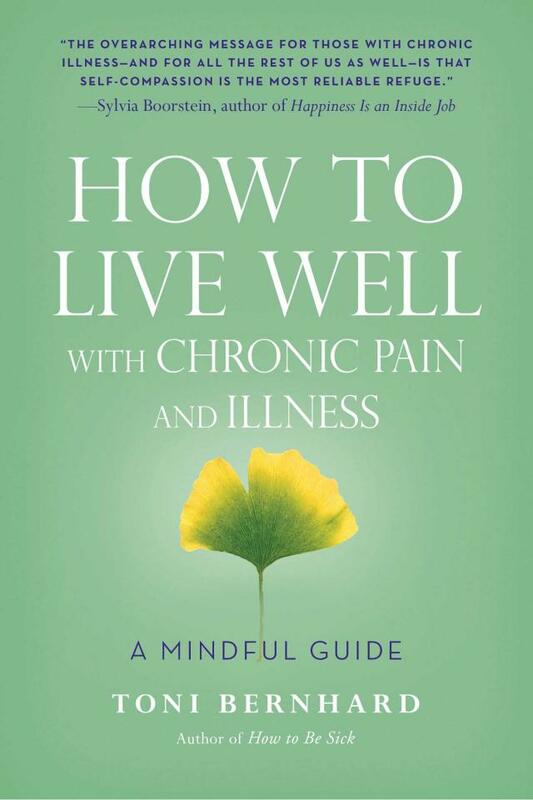 I get persuaded into thinking by the dozens of self-help books I read each year that I have the power to fix every symptom of every condition I have with the right supplement or relaxation technique or food combination. And if I can’t? Then I’m not trying hard enough and have given up. Here’s a secret: I observe that women in my practice with learned helplessness have a far more difficult time achieving the hormone cure. Please answer this question honestly: Do you have the pattern of learned helplessness? Do you feel you lack the power to change your eating, exercise, and other health habits? In contrast, women who understand the many positive consequences of their lifestyle reset — such as cutting out sugar and flour, and walking most days of the week — achieve the hormone cure much more rapidly and sustain it. The most successful women in my practice also recognize that the locus of control is internal — they understand they have the power to change, and cultivate hope and accountability about meeting their health challenges. Trying too hard — perhaps the opposite of learned helplessness — is the very source of my suffering. But it’s hard to exercise self-compassion and know when enough is enough when you have people like Arnold Schwarzenegger and other celebrity types saying things like, “Learned helplessness is the giving-up reaction, the quitting response that follows from the belief that whatever you do doesn’t matter.” In our results-oriented culture, it’s all about pushing yourself beyond your limits, because “life begins at the end of your comfort zone” (Neale Donald Walsch). One June afternoon, I panicked when I realized I might not ever experience a reprieve from the death thoughts. Many people think it’s their fault when they become chronically ill. They see it as a personal failing on their part. We live in a culture that reinforces this view by bombarding us with messages about how, if we’d just eat this food or engage in that exercise, we need never worry about our health. For many years, I thought that the skillful response to my illness was to mount a militant battle against it. All I got for my efforts was intense mental suffering — on top of the physical suffering I was already experiencing. The pivotal moment for me came when I realized that, although I couldn’t force my body to get better, I could heal my mind. 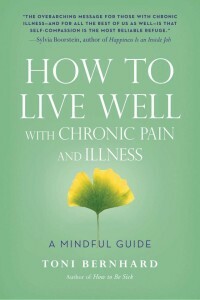 From that moment, I began the process of learning (to reference the title of my first book), “how to be sick,” by which I mean how to develop skills for living gracefully and purposefully despite the limitations imposed by chronic illness…If there’s no escaping our measure of disappointment and sorrow, then the path to peace and well-being must lie in learning to open our hearts and minds to embrace whatever life is serving at the moment. This is a mindfulness practice — mindfulness infused with compassion for ourselves. I consider Toni my coach and inspiration when it comes to living gracefully within my limits. From her, and from other companions with infuriating health conditions, I have learned that life isn’t about waiting for the storm to pass. It’s not about fixing every symptom so that you can go to a dinner party without anxiety or help your daughter with her homework without abdominal pain. Life with chronic illness is about dancing in the messy wetness, accepting the perspiration of the universe for what it is, and — with the right umbrella and guidance and support from others who have been there — doing an elegant jig in the moment.